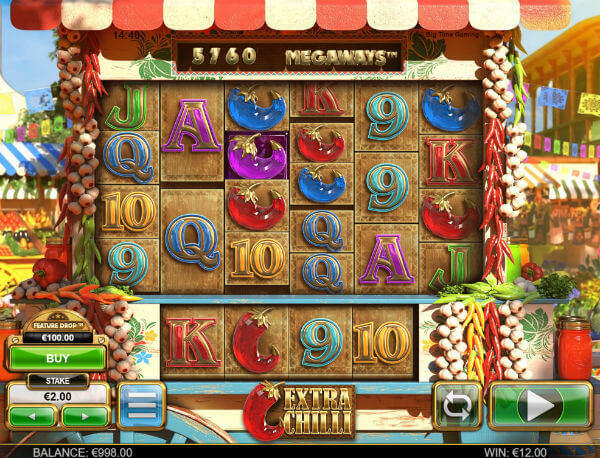 Big Time Gaming takes you south of the border in its video slot titled Extra Chilli. With the reels set against a colourful Mexican market, this brand new slot machine offers a spicy experience with plenty of opportunities to grab big bucks. 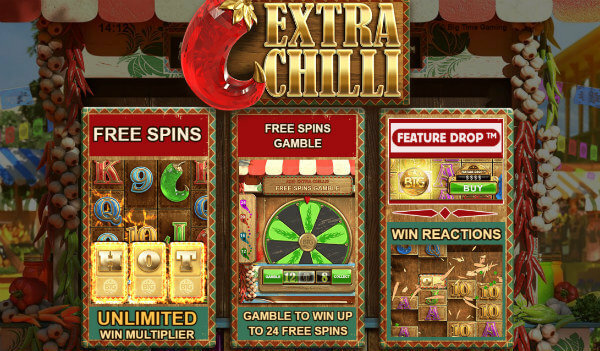 Extra Chilli features stunning visuals, with a lot of vibrant colours, and six reels, while its most appealing part is the fact it features Big Time Gaming Megaways game engine, where the number of ways to win changes with each spin. Once it reaches its maximum, it offers a staggering 117,649 ways to win! Players will benefit from the Free Spins feature, while the Free Spins Gamble feature can get you even more spins. But be careful. This is a high variance game, and you can lose all of your money before you know it! Thanks to the Megaways game engine, the number of ways to win will may go up with each and every spin, going up to a fantastic 117,649 ways to score a win! The fireworks Wild. Substitutes for other symbols, thus helping players complete additional winning lines. Free Spins. Not only will you get free spins, but there’s also an expanding multiplier on offer. Grab even more free spins with the Free Spins Gamble feature. High variance. You can win up to 20,000 times your total stake on every free spin! Colourful and vibrant visuals will captivate you as soon as you start playing the game. High variance. Inexperienced players could quickly lose all of their money. You don’t like spicy food. RTP of 96.2% is considered average. There are much looser slots to be found online. The game offers enough features to make the whole playing experience exciting. Extra Chilli utilises collapsing reels, which means winning combinations are removed from the reels and replaced by new symbols falling in from above. This way you can get additional winning combinations, significantly increasing your winnings. Land three symbols that spell out H.O.T. to activate the Free Spins round. Initially, you’ll receive 8 spins while each additional H.O.T. will award 4 additional spins. The Free Spins Gamble feature can be triggered where you can gamble your spins and win up to 24 of them, or lose them all. 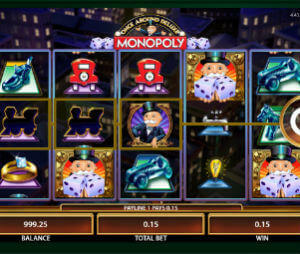 The Free Spins round also offers multipliers that increase by 1 with every successive symbol drop win. If you’re too impatient, you can pay to trigger the feature if you wish by using the Feature Drop, while the price varies depending on your wager, and is decreased by up to two coins when a gold coin lands on the reels. Extra Chilli is a nice looking game that can offer an exciting playing experience. If you’re a penny punter or player without any significant experience, you should avoid playing this one, since you’ll probably lose all of your money before actually having a chance to win any.